We provide all the support and guidance you need to deal with new risks and opportunities. We ensure easy access to the right people, so decisions can be made quickly and confidently. A consistent team will partner with you to support your aspirations and contribute to your success. You’ll have access to a range of core services, including audit, accounting, tax, risk and systems assurance, corporate finance, restructuring and insolvency, wealth management and disputes analysis. As a Top 20 accounting and advisory network we support a broad range of individuals and entrepreneurs, large organisations and complex international businesses. If your business and personal interactions need to expand, we’ll help make it happen – coordinating advice from a network of offices throughout the UK and in more than 100 countries. Each Moore Stephens firm in the UK is a member of Moore Stephens International Limited (MSIL), a global accountancy and advisory network headquartered in London. MSIL and its member firms are legally distinct and separate entities. 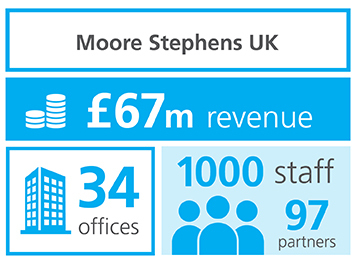 Moore Stephens UK Limited (MSUK) acts as an umbrella organisation for the Moore Stephens member firms in the UK. Our values embody who we are and guide us in everything we do.